Dhanvantari is the Hindu god of medicine and an avatar of Lord Vishnu. He is mentioned in the Puranas as the god of Ayurveda. He, during the Samudramanthan arose from the Ocean of Milk with the nectar of immortality. It is common practice in Hinduism for worshipers to pray to Dhanvantari seeking his blessings for sound health for themselves and/or others, especially on Dhanteras or Dhanwantari Trayodashi. The Indian Government has declared that Dhanwantari Trayodashii Kumara every year would be celebrated as "National Ayurveda Day". "Ramayana Balakand" and Bhagavata Purana state that Dhanvantari emerged from the Ocean of Milk and appeared with the pot of amrita (elixer for immortality) during the story of the Samudra (or) Sagara Mathana whilst the ocean was being churned by the Devas and Asuras, using the Mandara mountain and the serpent Vasuki. The pot of Amrita was snatched by the Asuras, and after this event another avatar, Mohini, appears and takes the nectar back from the Asuras. It is also believed that Dhanvantari promulgated the practise of Ayurveda. Of special mention here is the treatise of Dhanvantari-Nighantu, which completely elucidates Dhanvantari's medicinal plants. According to the ancient Sanskrit work Vishnudharamottara, Dhanvantari is a handsome individual and should usually be depicted with four hands, with one of them carrying Amrita, the ambrosia. Dhanvantari is depicted as Vishnu with four hands, holding Shankha, Chakra, Jalauka (leech) and a pot containing Amrita. He is often shown with a leech in his hand rather than the scriptures. His birthday is celebrated by the practitioners of Ayurveda every year, on Dhanteras, two days before Diwali, the Hindu festival of lights. It is also celebrated as National Ayurveda Day in India. The National Ayurveda Day celebrations started since 2016. God Shri Dhanvantari at Ayurved Sankul Anand, which is a premier institute of Ayurveda situated in the Milk City of India, Anand, Gujarat. In Konkan, There is a Dhanvantari temple at Dapoli, District Ratnagiri, Maharashtra. It belongs to Dongare family and is owned and run by Vaidya Aniruddha Dongare. Many devotees from konkan and rest of Maharashtra visit the temple and offer their prayers. There are a few dedicated temples to Dhanvantari in South India especially in Kerala and Tamil Nadu, where ayurveda is highly practised and patronised. The Thottuva Dhanwanthari temple in Kerala is a particularly famous temple, where Lord Dhanvantari's idol is almost six feet tall and facing east. On the right hand the lord holds Amrith and with the left hand the lord holds Atta, Shanku and Chakra. The 'Ekadasi' day celebration, which falls on the same day as the 'Guruvayur Ekadasi' is of special significance. In Tamil Nadu, in the courtyard of Sri Ranganathaswamy Temple (Srirangam), there is a Dhanvantari shrine where daily worship of the deity is performed. In front of this temple there is an engraved stone believed to be from the 12th century. According to the writings on the stone, Garuda Vahana Bhattar, a great ayurvedic physician, established the statue inside the temple. A prasada or theertham, a herbal decoction, is given to the visitors. The shrine is the oldest Dhanvantari shrine in the state. Another Dhanvantari shrine is found in the second precinct of Varadaraja Perumal Temple in Kanchipuram. Shri Aalkkalmanna Dhanwanthari Temple is situated at Eranthod Village, Angadippuram Panchayat, Perintalmanna Taluk of Malappuram District. There is also Sri Murrari Dhanvantri Moorthi Kshetram temple in kollam district(boothakulam) paravur.It belongs to a family called Thundvilla, it is owned and run by the family members itself .People offer prayer for there beloved ones and offer paalpayasam to god . In Varanaseya Sanskrit Vishwavidyalaya, Varanasi, Uttar Pradesh state, one statue of Dhanvantari is present in the University museum. Two statues are at the headquarters of the Central Council for Research in Ayurveda and Siddha at New Delhi. There is another statue inside the Ayurveda Maha Sammelan office, Dhanawantari Bhawan at New Delhi and one statue of Dhanvantari is present at Mohyal Ashram in Haridwar. ^ a b "Dhanteras to be observed as National Ayurveda Day - Times of India". ^ "Sri Danvantri Temple". www.danvantritemple.org. ^ "Thevalakkadu Sree Dhanwanthari Temple Kulasekharamangalam, Vaikom, Kottayam, Kerala, India". www.sreedhanwantharitemple.in. ^ "Official website of Maruthorvattom Sree Dhanwanthari Temple: Temple of Lord Dhanwanthari, the Master God of Ayurveda". www.dhanwantharitemple.org. ^ "Sree Dhanwanthari Temple Prayikara, Mavelikara". sreedhanwantharitemple.com. Madhavan, Chitra (2008). Vishnu temples of South India, Volume two. Chitra Madhavan. ISBN 978-81-908445-1-2. 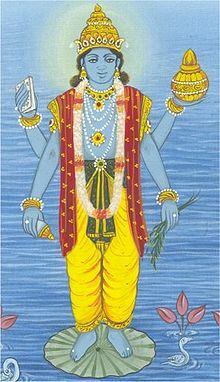 Wikimedia Commons has media related to Dhanvantari.